We work so dogs can play . . . Works for cats too! At Dog Fence, we understand that your pet is an important part of your family. With our pet containment systems you can have confidence and peace of mind about the safety of your pet. Our containment fences are the most advanced and safest electronic fence systems available. Dog Fence are the only UK company to offer a professional installation & training service. Due to our in the field experience we are also able to give excellent support to our overseas customers. The quality & engineering in our electronic dog fences is mirrored in our customer service standards. Our Dog Fence systems are designed to work together. They use the same receiver collar both indoors and out. All our Pro Fence systems include professional installation and expert pet training. So, whether your pet is the garden lover, lounge lizard, or somewhere in between, DogFence has solutions to match. DogFence Ltd is a family owned business. Ward & Sam Chapman strongly believed that there was a gap in the market for a professional brand system supported through professional installation & training. Having spent time training in the USA they brought their knowledge and the world’s most advanced electronic fencing system to the UK. The success of the system is not just the a great product but to ensuring that the dog or cat is correctly trained. It is also that the customer is offered full support not just at the point of installation but for the years post installation as well. Fastest Reacting Collars worldwide – 15 times quicker than any other system. Safest System available worldwide – guaranteed no false activation. Our dog fence systems should not be confused with other systems such as Freedom Fence, and Invisible Fence which use the AM frequency and are made and assembled in china. A Dog Fence or electronic dog fence uses an electronic radio signal transmitted through a buried or hidden boundary wire. These fences are sometimes called a ‘radio pet fence. Your dog (or cat) wears a special collar with a receiver that detects the radio signal and alerts the dog when he gets too close to the wire. It is easy and it is safe . . . and it will keep your pet safely in your garden. Size is immaterial whether you have a small town garden or a sprawling country estate a containment fence will keep your pet home. What a Dog Fence Is Not? The our dog fence is not an electric fence nor is it an electric dog fence! The brand that we supply is the DogWatch Hidden fence. Our brand and other ‘invisible’* pet fence systems are a form of electronic dog fence which use a radio signal. The wire is not electrified. Hidden and “invisible” radio pet fences should not be mistakenly referred to as an ‘electric’ fence or an electric dog fence. Our fences do not generate an electric shock. 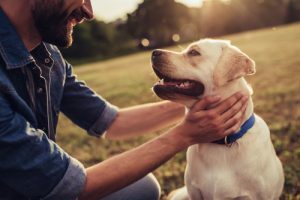 Through an easy training process, your pet learns to identify and stay within his boundaries. He learns to respond to an audible signal (a beep that comes from his collar). If he continues to go beyond the audible signal, he receives a mild correction transmitted through the receiver collar. Most dogs learn easily and quickly to respond the audible warning signal rather than the correction. Dog Fence systems are safe for your dog or cat and they are effective at keeping your pets safe. Vets, pet professionals and pet trainers all over the world own and recommend Dog fence systems. If you have an escaping dog issue or have lost a cat on the road our containment fence is the best way to give your pet the freedom he deserves while keeping him safe.